(ph. Roberto Barnabà for Elettra) New Elettra and IAEA XRF experimental station: a new facility contributing to nanomaterials research for environmental applications, cultural heritage conservation, microelectronics and energetics. 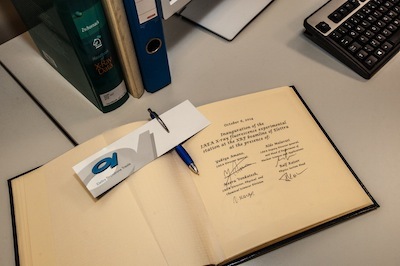 The opening ceremony for the new XRF X-ray fluorescence beamline jointly built and run by Elettra Sincrotrone Trieste and IAEA (International Atomic Energy Agency), was held on Monday 6th October 2014. 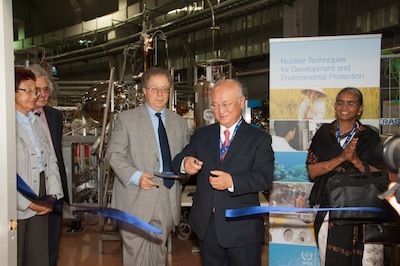 The General Director of IAEA Yukiya Amano and the president of Elettra Sincrotrone Trieste Alfonso Franciosi, among others, attended the ceremony. 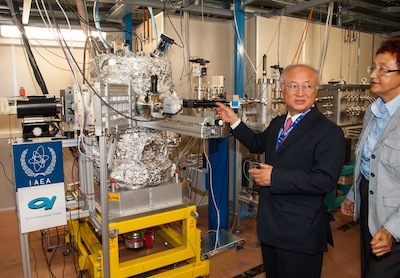 The XRF experimental station employs synchrotron light using X-ray fluorescence spectrometry — a technical procedure that yields extremely accurate chemical information. These data are particularly well-suited to investigate and characterise new structured materials having a wide range of potential applications, such as new energy sources and energy storage technologies, micro and nano electronics, the analysis of environmental and biochemical environments, food safety and cultural heritage conservation. According to the President of Elettra, Alfonso Franciosi, «This new XRF beamline will provide the international scientific community with innovative means to address some of the most urgent challenges of our times. Throughout the world nations increasingly require new technologies, advanced materials and innovative characterisation techniques in order to cope with a number of urgent issues: increasing energy production efficiency and sustainability, addressing energy storage problems, restraining the adverse effects of industrialisation on human health and the environment, devloping techniques for environmental rehabilitation, analysing air and water contamination factors and so on». 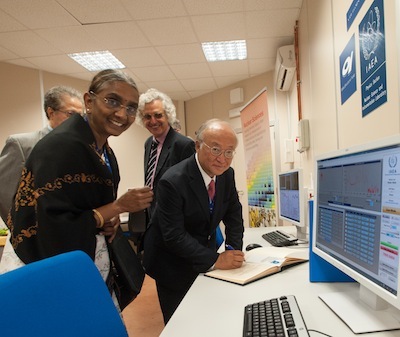 Indeed, it is aiming to contribute to research in these fields that IAEA has commissioned a special experimental chamber which constitutes the analysis nerve centre of the XRF beamline designed by the researchers at Elettra. 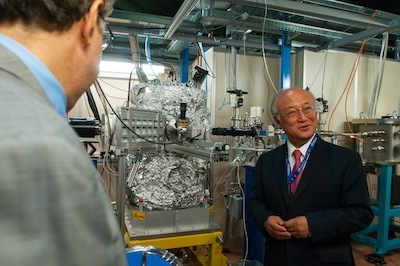 The new experimental station will also be used for the research and advanced training purposes of IAEA Member States, with particular reference to visiting scientists from developing countries and establishing connections between large research groups and emerging research teams. Elettra and IAEA have been collaborating for several years: back in 2005 the Trieste research centre was included among “IAEA Collaborating Centres”for the purpose of supporting the Agency’s activities in disseminating scientific and technical culture and of promoting international networks among research players worldwide.